DesignMade of a single sturdy piece of aluminum, mStand transforms laptops into stunning desktop counterparts of the Apple iMac and Apple Cinema Display with its elegant curves and silver-anodized finish. The single piece design solidly holds a laptop while the aluminum panel acts a heat sink to keep the laptop cool. 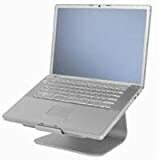 A cable hole in the back of the stand routes wires to reduce clutter.ErgonomicsLong-term use of a laptop as the main computing device can strain the body as the user hunches down to see the screen and type. mStand raises the screen 5.9 inches (150 mm) to meet the user's eye level, thus promoting better posture, while its tilt design brings the screen closer for easier viewing. With an external keyboard andmouse, mStand creates an ideal ergonomic desktop setup for laptop users.Compatible with all sizes of Apple MacBook, MacBook Pro, Powerbook. Also fits most 14" standard PC and 15" widescreen PC with depths not more than 10.4 inches.